Please note that this press release was corrected 25. January 2019 at 10:45. Disposable income of the household sector in 2017, as measured by national accounts methods, increased by 9.9% from the previous year, while per capita income increased by 7.4%. 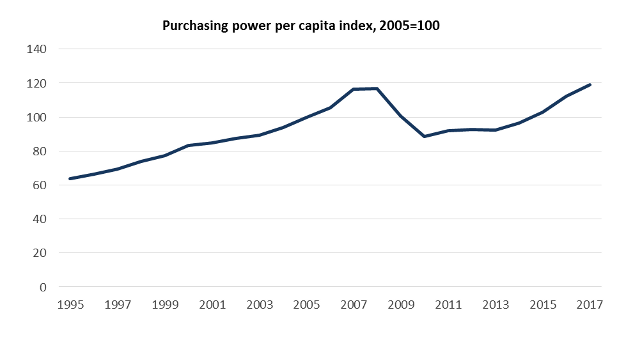 Measured in real terms, purchasing power per capita, increased by 5.5%. Households’ total income increased by 9.2% from the previous year. Thereof, total compensation of employees increased by 8.4%, property income by 13.9%, operating surplus from sole proprietorship by 5.8% and current transfers received increased by 13.2%. Total expenditure (i.e. property expenditure and current transfers paid) increased by 9.0% in the same period, thereof current transfers paid increased by 10.6% whereas property expenditure decreased by 2.8%. Previously published figures for operating surplus from owner occupied dwellings have been revised for the years 2009-2016. The National Accounts unit at Statistics Iceland undertakes periodic revisions when final figures have been established. The most affected item category in households’ final consumption was owner occupied dwellings. This category was revised for the years 2009-2016. This revision took place when data on rental prices were obtained through statistics on income and living conditions, a survey conducted by Statistics Iceland.